The Indian e-tailing consumers are getting more and more habituated with ordering through mobile phones. 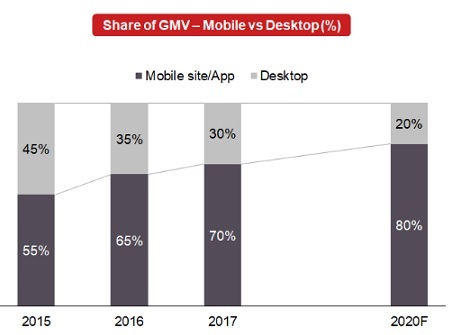 The share of GMV ordered via apps and mobile websites accounted for nearly 70% in 2017. This was powered by increasing usage of smartphones in India and falling rates of data due to the effect of players like Jio. We feel this trend would continue; a new set of consumers who would be arriving in the platform would largely be from Tiet 2+ cities who would be using mobile phones primarily to place the order. 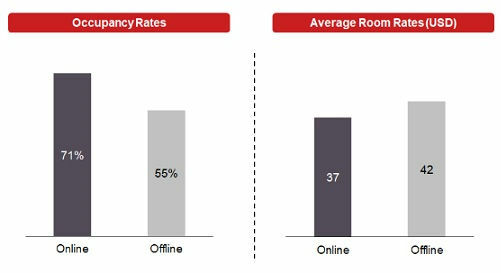 The Indian hotel industry currently has 17% of the inventory present online and about 21% of booking are done online. The OTA players are able to add good value to the partner hotels. Though the room rates offered via OTAs is low; the OTAs are able to provide much higher occupancies resulting in the overall value addition. The ed-tech industry has seen a steady growth of user base (including paid and free users) across the quarters in 2017. The key reasons for this have been the aggressive marketing initiatives taken by the players and strengthening of lead generation team. 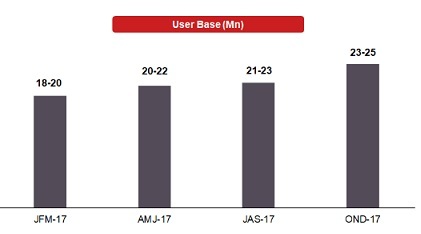 Though the majority of this increase came from free users; there was an increase in the paid users as well. This is a good news for the industry as free users on an average use the free version for 6-9 months before buying the paid services. So we can expect the effect of this to come in big time in 2018. The local Kirana/mom-pop shops have become the target audience for a bunch of upcoming startups who are trying to solve the day-to-day business problems for them. With about 70% of the Kirana stores in metros and 37% in T2 cities willing to use software/technology for managing the business, there is a huge market potential for these offerings. We feel going forward this segment would be interesting to look at as a number of startups would target it by trying to solve various problems like inventory management, account management etc.